So far this season, Victor Oladipo is one of the obvious standouts in the 2013 NBA rookie class, but he was not always considered an NBA talent. Overlooked much of his career, a fire burns inside Oladipo to be great and he is on that path. The multi-threat guard does many things well and that is why the Orlando Magic took him early in the draft. 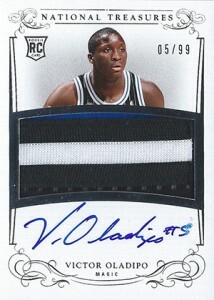 As one of the top rookies in the 2013-14 class, Victor Oladipo rookie cards are commanding strong values and looking to move higher. 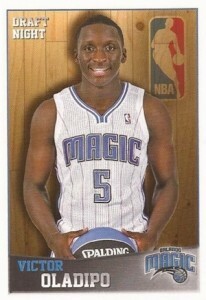 Shop for Victor Oladipo rookie cards on eBay. Victor Oladipo elected to play college basketball at Indiana University after an impressive career at basketball powerhouse, DeMatha Catholic High School. Following a solid Sophomore season, Oladipo emerged as a star during his Junior year. He was named a First Team Consensus All-American, Big Ten Defensive Player of the Year and Co-NABC Defensive Player of the Year. Oladipo declared for the draft after his Junior year, foregoing his Senior year with the Hoosiers, and was widely considered to be a top five pick. He did not have to wait long to hear his name as the Orlando Magic took him 2nd overall. Since the Magic are in rebuilding-mode due to the Dwight Howard fiasco, Oladipo has seen consistent minutes and was named the Rookie of the Month in December and February. 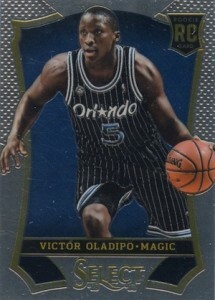 Of all the 2013 rookies, Victor Oladipo projects as one of the the best long-term players and collecting investments. 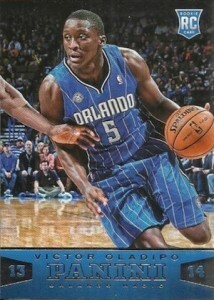 The following list features all Victor Oladipo rookie cards that are currently available. 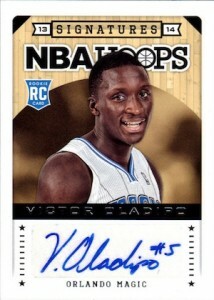 Victor Oladipo also has cards in 2013 Leaf Sports Heroes, which includes multiple autographs. Please note that this list will be updated as new 2013-14 NBA products are released. Click on the card listing to shop for singles on eBay. 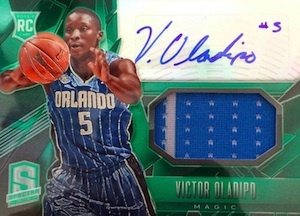 With a heavy dose of blue, Victor Oladipo's rookie from the base Panini product is reminiscent of how the Orlando Magic fan base has been feeling. 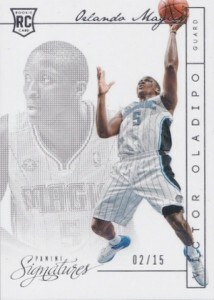 Fans and collectors hope Oladipo can bring back the franchise's winning ways and this card is one of the better low-end cards for the young stud. Panini Court Kings made a colorful return after several years in limbo. 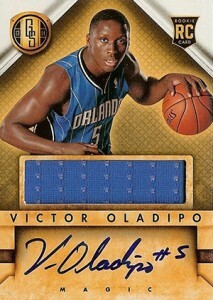 Victor Oladipo has four cards with increasing rarity and three are numbered. The rarest card is not shown below, but the black-and-white card, numbered to 49, is easy to distinguish. 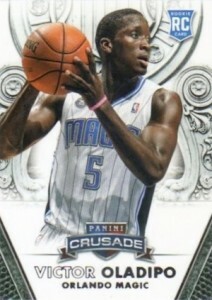 Flashy, it is not, but if you like intricate backgrounds on low-end rookies, 2013-14 Crusade is the product for you. Collectors who prefer a shiny option are also in luck with the Crusade inserts. Although not a true rookie, these cards are clearly the preferred rout for most collectors who bust this basketball product. While the high print run will keep values low, the Victor Oladipo rookie card from Elite includes a classic design and is serial numbered. The mirror finish makes these cards very condition sensitive. Most years, Gold Standard is among the better mid-level products for rookie collectors, and 2013-14 Gold Standard is no different. 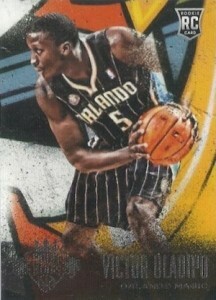 Victor Oladipo's rookie card includes an on-card signatures and narrow jersey piece. A lower print run would push it to the next level, but the un-numbered card will still remain a collector favorite. Hoops is not going to amaze anyone, but it is normally the first product each year and the rookie design is generally solid. 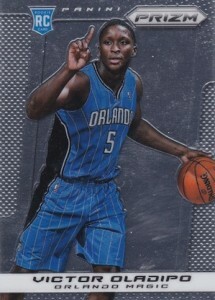 The 2013-14 Hoops Victor Oladipo rookie card combines a large posed image with hardwood trim and Orlando Magic blue. 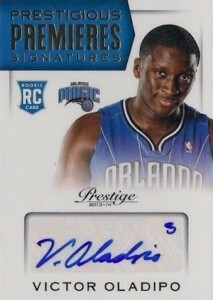 More popular, especially this year, Oladipo's NBA Hoops Signatures card has yielded impressive values despite coming from a budget product and using a sticker autograph. The cream of the crop. There is not much else to say about National Treasures and seasoned basketball collectors have come to view the luxury product as the top place for basketball rookie cards. The 2013-14 Panini National Treasures rookie includes an on-card signature, large patch and print run of only 99. 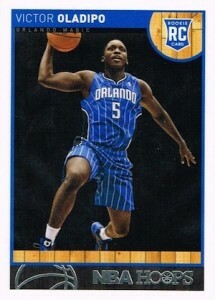 The Victor Oladipo rookie card in Pinnacle represents one of the most simple base rookie card options. The design is not amazing, but the parallels add another element for collectors. Preferred is a combination of various other products into one big autograph repository. Four different signed cards in 2013-14 Panini Preferred could make a claim at rookie card status for Oladipo, but the most plentiful and popular option is the Silhouette subset. While not numbered, the card still boasts a large on-card signature and jumbo jersey piece. 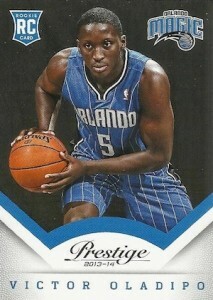 Like Hoops, 2013-14 Prestige is an early season budget product. 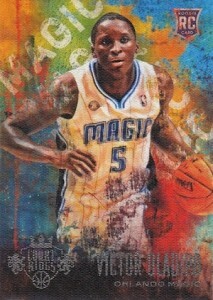 The image on this Oladipo rookie card is not as fun, but the the clean design makes for a more professional look. Prestigious Premieres Signatures offers higher values for collectors looking for more valuable options than the true base rookie. Panini's version of Topps Chrome, 2013-14 Prizm follows the same format that made it a success last year. 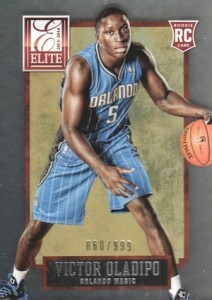 The base rookie for Victor Oladipo offers collectors a solid mid-quality card for a relatively low price. The higher values can be found with the many parallels and autographed versions. Prizm's colorful cousin, 2013-14 Panini Select adds a dash of color to the chromium design. 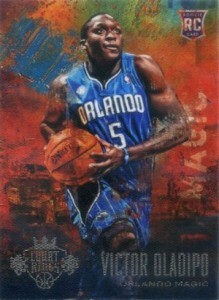 The deep blue of the Orlando Magic gives this Victor Oladipo rookie card a nice contrast against the silver border. While Panini Stickers does not offer the same excitement as other products, the stickers can be a fun change-of-pace for collectors and great way to expose aspiring collectors to the hobby. 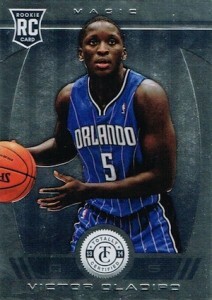 The simple sticker card offers a draft night image of Victor Oladipo. 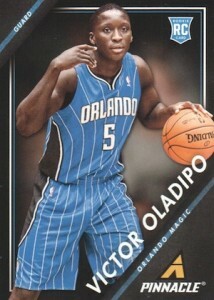 Many may scoff at a base rookie that is numbered to 15 and includes ten different options, but as the rarest individual rookie card available for Oladipo, collectors will still pay attention to Oladipo's rookie cards in 2013-14 Panini Signatures. Another non-numbered autograph for Oladipo, this 2031-14 Panini Spectra sticker autograph may not sit well with collectors given the premium price tag. The base green color also tends to dominate the design and even a medium patch cannot save it. 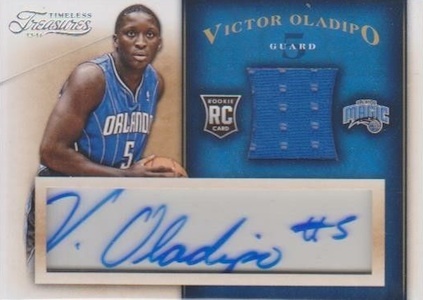 Although the trapped signature layout is not the preferred method, 2013-14 Timeless Treasures brings collectors the first signed official rookie card for Victor Oladipo. A small jersey piece adds some additional value to the card. Titanium is a new option for basketball collectors, but it carries the same elements that it showcases with NHL cards. 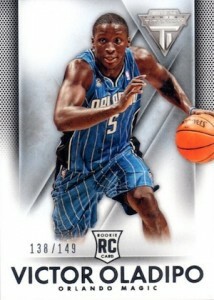 The most plentiful base rookie for Victor Oladipo is found in retail packs, but various rare parallels offer a more valuable option. One of the more popular mid-level releases, 2013-14 Totally Certified again brings foil cards to collectors and plenty of parallels. The dynamic blue of Victor Oladipo's jersey contrasts well with the silver card and helps provide a good-looking base rookie card. 2013-14 Panini Select VICTOR OLADIPO Silver Prizm RC GMA 10 Gem Mint! 💎 Pacers! Johnm Palmer � Cardboard Connection does not sell direct. We have listings for eBay as well as ads from select advertisers. 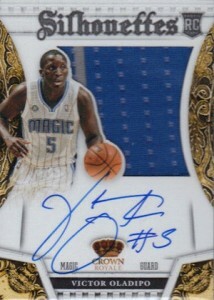 VICTOR OLADIPO AUTO 2014 NATIONAL TREASURE # 49 INDIANA PACERS MVP?